Little Mercy James clutches her new sister Lourdes’ hand as Madonna introduces her to her new family. The four-year-old was pictured yesterday with Lourdes and her soon-to-be new mum Madonna, who was just feet away dressed in a sarong, T-shirt and panama hat. The singer has hit back at criticism that she has used her status and power to ‘fast-track’ the adoption process by saying she has followed all ‘standard procedures’. Her spokeswoman, Liz Rozenburg, released a statement saying: ‘The adoption process for Mercy began over a year ago when Madonna met her on one of her visits to Malawi. The connection was instant and profound. ‘Madonna‘s desire to adopt Mercy is totally heartfelt. But outraged human rights groups have suggested the singer should be providing financial support to Mercy’s existing family – her poverty-stricken uncles Peter Baneti and John Ngalande and grandmother Lucy Chekechiwa – so they can care for Mercy themselves. A coalition of non-governmental organisation Human Rights Consultative Committee said Madonna‘s adoption of Mercy should only be a last resort for the child and her family should be assisted in caring for the tot. Save the Children spokesman, Dominic Nutt, said: ‘It is vital, we say, that children should be cared for in their own environment by their own community, ideally by their own family. 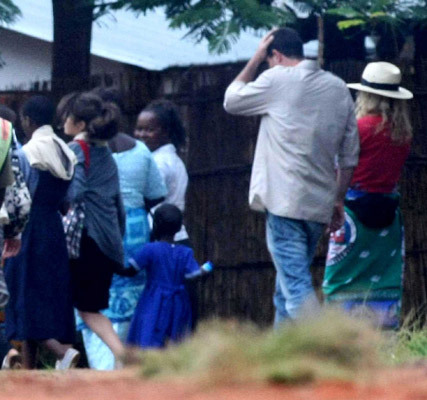 Meanwhile, Madonna yesterday took her children David Banda, Rocco and Lourdes to the Home of Hope orphanage, where Malawi-born David lived before she adopted him. The orphanage’s director, Lucy Chipeta, showed them the room and crib that he had used. The Material Girl appeared in court on Monday in a bid to convince judges of her suitability to adopt Mercy, whose 18-year-old mother died five days after giving birth to her. She is expecting to hear whether she has been successfully granted adoption on Friday.